Sometimes I feel really guilty about the amount of mail I cram into my mailbox for our carrier to pickup. I mean, we've spoken and he says he's cool with it. In fact, he quickly learned that he should just park the truck right in front of our house every day. But today the guilt got to me a bit. And I came up with what I thought was a genius plan. I just filled up a Halloween goodie bag with some of our leftover candy. He gets a little afternoon candy pick-me-up and I get some more candy out of the house. Win win! 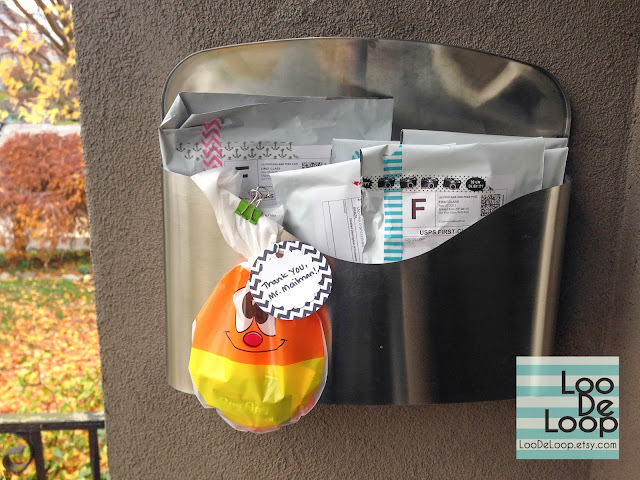 I love your mailbox and your plan!